Riding rocks, but so does WIND THERAPY! Note: Leslie Cook, who created the Wind Therapy line of hair and skin-care products, recently sent me samples of her products for my honest opinion about their use and effectiveness. Below are my thoughts! Between the street in front of my house being closed for reconstruction since June 9 (JUST re-opened a couple weeks ago!) and temperatures in the mid-to-upper 90’s the past few weeks, I haven’t done much riding since early June. 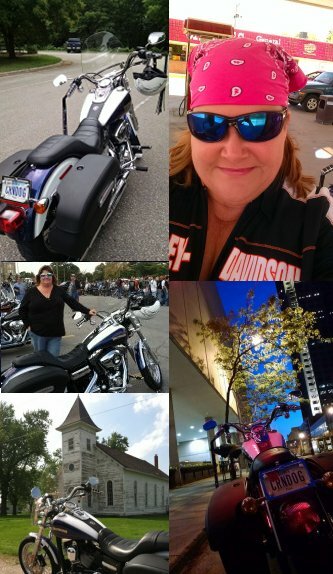 BUT – I did finally get to venture out with the Chrome Divas on Saturday the 23rd. More about that soon! What I really want to tell you about is that I finally got an opportunity to give a “fair trial” to some new personal care products for women who ride. 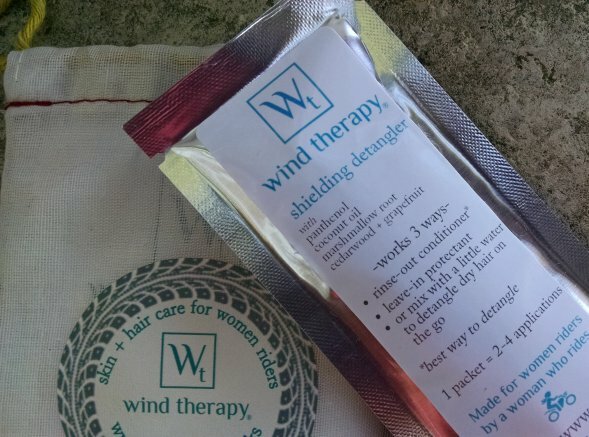 Maybe you have already heard about “Wind Therapy” – a new line of skin and hair care products from rider Leslie Cook. If you haven’t tried them, I hope you will! Leslie was kind enough to send me some samples recently, and I promised I would provide you-all with a recap of my experiences using them. I felt a little funny doing that, however, knowing I wouldn’t be trying them on a motorcycle ride – the very activity they’re designed to improve. So while I’ve had the products for a few weeks, I finally was able to try them over the weekend. 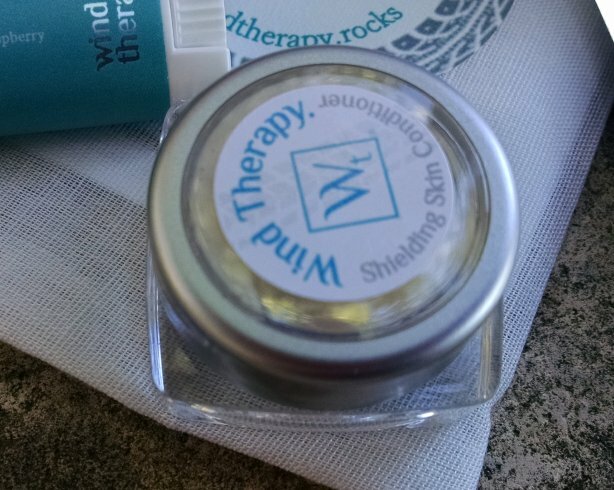 The product samples I received were Wind Therapy Shielding Lip Conditioner, Shielding Skin Conditioner, and Shielding Detangler. I used all three as directed, during and after my ride on Saturday the 23rd. 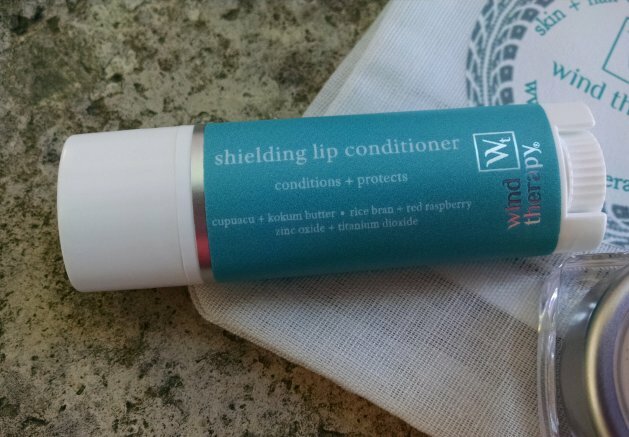 Shielding Lip Conditioner – I have a love/hate relationship with lip balm. It is the one thing I almost always forget to take with me, and begin to miss it after about 60 miles on the bike. So I usually end up buying some at a convenience store, and as a result I have probably ten of them floating around the house at any given time. My product of choice has always been Chapstick. What I dislike about Chapstick is how thick it feels once applied, and how “goopy” it gets after being on my lips for some time. Wind Therapy Shielding Lip Conditioner does not have these issues. It feels like a thin, sheer layer on my lips, and feels the same after a 90-mile ride as it does when first applied. It has no flavor or scent. When I use it overnight, it works continuously to keep my lips hydrated and soft. Shielding Skin Conditioner – My normal routine when prepping for a ride is to apply a large helping of moisturizing lotion to my arms and face, followed up with a heaping helping of sun block. The main problem I have with this method is that these exposed areas feel like they are covered with sludge by the time I get home – a layer of dirt and dust sticks to me precisely because of these products. What I appreciated about the Wind Therapy Shielding Skin Conditioner was that it seemed to alleviate this problem. It kept my skin hydrated, without the heavy feeling of a thick layer of lotion. It felt light and non-greasy when I applied it to my arms and face, and my usual layer of sunblock therefore also felt lighter because it didn’t have the thick undercoat. This product also has a light fragrance, but I must confess I did not care for it – it seems too “mediciney,” more like a medicated lotion such as Sarna. (This complaint was alleviated once I put on my tropical-scented sunblock.) I did like the “weight” of the product on my skin, though – it seemed to literally disappear when I put it on, rather than feeling like a thick layer – as well as the job it did protecting my skin from drying out. Shielding Detangler – This is the product I assumed I would need the least. I keep my hair fairly short, and I wear a helmet when riding. So, honestly, tangles are not really a problem for me on the road. (More about how I used it in a moment.) I will say, that what’s unique about this product is that one of its uses is as a detangler during a ride. To do this, you simply wet your hands and work the detangler into your hair. There is no need to immediately rinse it out – you can leave it in your hair. While I didn’t try the product in this way, I did give it a try as part of my usual hair care routine: I simply used it as a conditioner after shampooing my hair in the shower. My routine here is to first shampoo, then use conditioner, all of which of course I rinse out. Out of the shower, I pat my hair with a towel so it’s not dripping wet, then comb it out. In this use, I was really surprised at how easily I was able to pull the comb through my hair – usually tangles remain, but with this product, they did not. Once fully dry, my hair had a soft and smooth texture that was nice, but I feared would prevent it from holding my usual style. I’m happy to report this wasn’t the case – my hair held its style with no problems. And, it worked better at removing the post-shower tangles than other conditioners I’ve tried! 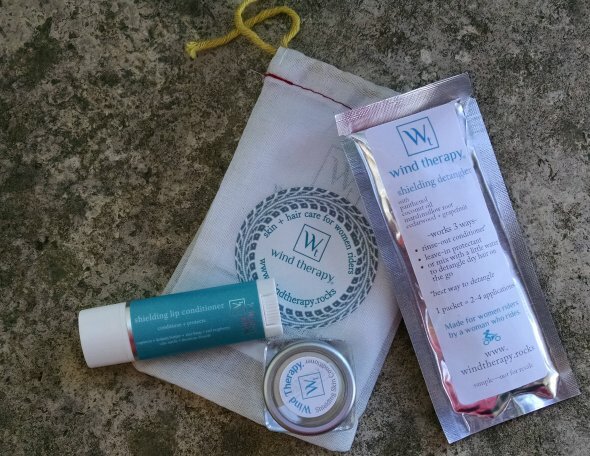 Overall, while I know there are others who can give the Wind Therapy products a more rigorous trial, all the products I tried were more effective than the brands I currently use and felt “lighter” on my skin and hair. I absolutely loved them and appreciated the chance to try them out! Please connect with Leslie on Facebook, and through the Wind Therapy website at www.windtherapy.rocks! Thank you for this wonderful review, Corn Dog! I’m so glad you tried them. I created these products at first just for myself. My challenge, and my goal, was to make things that worked better for me as a rider than anything else I had tried. 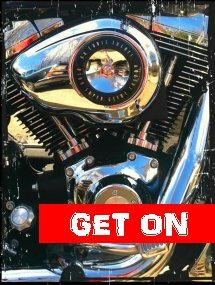 Ride on, and stay safe!! I love it too! All of the products. I notice the scent of the face conditioner fades after just a minute. Did you use it with water?